It’s time to plan what to grow in the garden. Yes, yes…it’s only January, but it’s time. A mug of something hot to drink, paper and pencil to sketch the garden plan, day dreaming of warm weather, your hands in the soil and fresh food and flowers – it’s a great way to spend a winter day. What should you grow in the garden? How much of each plant do you need? Where should it be planted? There’s a lot to consider but we’ll break it down into small items and make it easier. What should you grow? What do you like to eat? We’re going to start this series with tomatoes. We’ll talk about peppers, broccoli, cabbage, cauliflower, cumbers, pumpkins, squash and root crops, too. If there’s a vegetable you’d like to read about soon please let us know and we’ll bump it to the top of the list. Tomatoes are the all-time favorite. There’s nothing like a vine-ripened tomato, still cool early in the morning, full of natural sugar and juice, fresh from the garden. Cherry – prolific producers of tiny tomatoes. Cherry tomatoes are the candy of tomatoes. You can pick them and pop them into your mouth without having to slice them or worry about dripping juice and seeds on your shirt. One to two plants per person will be enough to provide you with fresh cherries to eat in the garden and plenty to bring into the house for salad and snacking. Slicing – thick slices of tomato on a BLT or cheeseburger come from slicing varieties. One or two plants per person should provide enough fresh tomatoes for the house and more to share with friends in a good year. In an iffy year with cool weather or too much rain, that should be enough for the household. Paste tomatoes – the varieties used for sauce, paste and stewed tomatoes. This one is a little trickier to decide. Production between varieties can vary a lot, the thickness of your sauce and stewed tomatoes is a personal choice, and how often you’ll want to use a pint or quarter is subject to your menu. The best thing about these tomatoes is that if you put up more than you use in a year they store well. Four plants per person is a conservative number. If you don’t have enough paste tomatoes you can substitute with cherry and slicing tomatoes but will need more of those per quart of end product because they aren’t as meaty and have more juice. Tomato plants can be as short as three feet tall and strong enough to support themselves to more than 20 feet long, clipped to twine and sprawling over support. Choose your varieties based on how big the plants will be at maturity and how much space you have for them. Most varieties need support. It can be as simple as a tomato cage or as involved as a solid frame. Twine strung from the frame can be used to clip the vines to. This method is labor intensive as it requires clipping and pruning several times a week but it produces large amounts of fruit. Determinate varieties of stop growing at their full height and ripen most of their fruits in a short time. They’re best for limited space and short growing seasons. If you want a lot of paste tomatoes at once for canning, chose a determinate variety. Indeterminate varieties of tomatoes continue to grow. They continue to produce fruit as they grow. They’re harder to control and require more pruning but if you have a long growing season and the space for them they’re a great way to go. 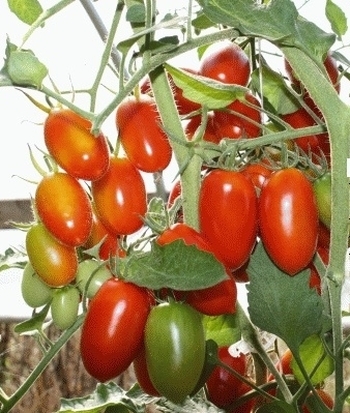 Deep watering once or twice a week is much better for tomatoes than frequent, shallow watering. Roots will grow deeply into the soil, pulling up nutrients and giving large plants a strong base. Adequate watering helps prevent blossom end rot (BER). Roots pull calcium into the rest of the plant as they bring in water. Shallow watering can causes problems when you get large amounts of rain. The tomatoes won’t be used to a lot of water, will grow too fast and the skins will crack. Next week we’ll talk about cool weather crops. This entry was posted in Gardening and tagged Gardening on January 26, 2015 by Homesteader's Supply. We’re going to talk about hunting small game this week. We asked followers on Facebook what they’d like to read and/or learn about a while back and hunting small game was one of the suggested topics. Hunting was a given decades ago. If homesteaders wanted meat on the table they hunted because they didn’t have livestock to move with them when they settled on their land. Hunting small game can provide meat on the table and it’s a means of keeping the pest population in check. Pests can do a lot of damage to a garden. Eliminating a pest, minimizing damage and providing meat is a win-win-win situation. Have you ever considered woodchuck stew? It’s been said that they taste best when they’ve been eating your best vegetable plants. Laws vary between states. It’s important to become familiar with your state’s laws to keep yourself out of trouble, keep yourself and others safe, and for the benefit of the animals you’re hunting. What weapons are you allowed to use? Most hunters use firearms for small mammals. A .22 caliber rifle is large enough to do the job. It’s a small, light weight rifle with little “kick” and fairly quiet. It’s suitable for everyone learning to hunt and young hunters. 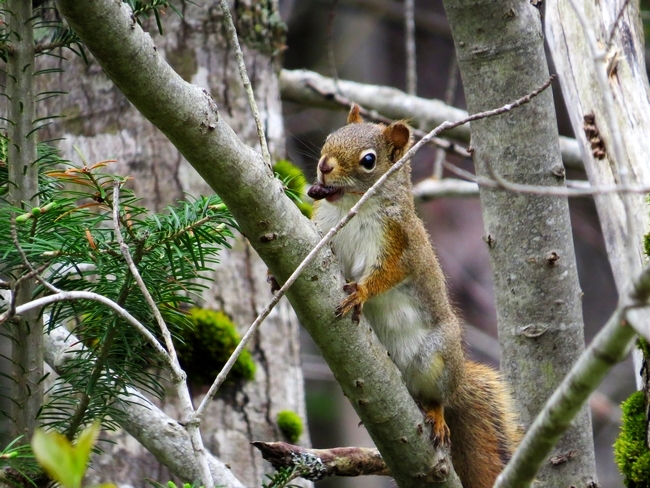 A .177 air rifle might do the job for small squirrels though it can be tricky. You absolutely must hit your target precisely otherwise you’ll only hurt the animal. Winter is hard time to use a small rifle like the .177. Even when the air pressure is high, the pellet might hit a non-lethal area of the body, bounce off and roll away. There are exceptions but birds are hunted with shotguns as a general rule. The smallest shotgun we use for bird hunting is the .410. It has a short range and is useful for small birds like dove, partridge and woodcock. It’s a great starter shotgun but will probably be outgrown quickly. Next up is the .20 gauge shotgun for small birds. For partridge and larger birds we use .12 and .10 gauge. Large birds such as turkey and goose require heavier loads and longer shells to bring the birds down humanely. You might choose a shotgun for small game. If I’m partridge hunting with a .20 or .12 gauge and happen to have a good shot at a snowshoe hare I’ll take the shot. I wouldn’t hesitate to shoot a squirrel with a .410 as long as I weren’t too close to the squirrel. Place your shots well. Tip Read boxes just like you read a food label for ingredients. The box should tell you the gauge, length, FPS (feet per second, or how fast the shot travels), oz (ounce) shot, and shot on shotgun shell boxes. Tip Bullet boxes for rifles are labeled similarly. Many manufacturers clearly label their boxes with the game the bullet is suited to. Study up. Start with .22 for hunting small game. This entry was posted in Homestead Happenings, Homesteading, How-To and tagged hunting, pest control on January 19, 2015 by Homesteader's Supply. The piglets arrived in late June. They ate all our food scraps, lots of spent plants from the garden, grass and clover in their pasture, and some commercial pellets. During a harsh old spell when the overnight temps dropped close to 0* they enjoyed a can of cracked corn each and extra flakes of hay. Everything was late except the cold weather. I was concerned about Red and White staying warm, and that maybe there wouldn’t be enough fat for salt pork. There was no need for concern. I made put up 36 pounds of salt pork today. It will sit at the bottom of the cellar stairs, hovering above freezing, for the next month. I’ll check it weekly to be sure it’s curing rather than spoiling. I wasn’t able to find the tons of information I expected on curing pork, specifically how to make salt pork, online. Turns out there’s not a lot to write about. It’s a simple process. 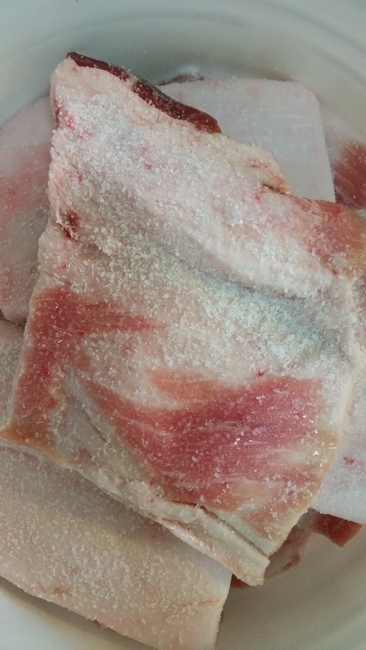 My pork belly was cut into slabs, vacuum packed and flash frozen by the butcher. I thawed the pork overnight in a cooler. You’ll need a container for your pork. A crock is great. If you don’t have a crock you can use stainless steel, plastic or glass. Wash your container thoroughly. 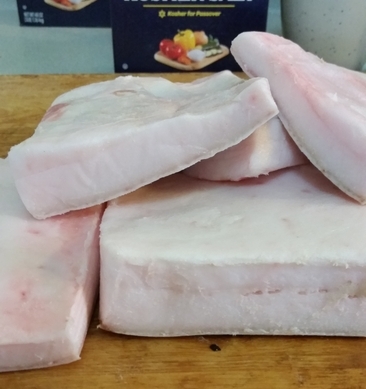 Cut 2.5 pounds of pork belly into slabs that are six to eight inches wide. Rinse each piece with cool water and dry well with paper towels. That’s it. This is very basic. Coat each piece of pork belly and stack them close together in your containers. I put a 1/4″ layer of salt and sugar on the bottom of the container before placing the first pieces. Add more salt and sugar blend to the pieces to make up for any you lose when moving the fat. More salt than necessary isn’t better. You don’t want your salt pork to be so salty it’s hard to use. One of the first recipes I’ll use the salt pork in is Boston Baked Beans. They’re a traditional Saturday meal around here. I’ll slice the salt pork and place it on top of the beans. The pork will help the beans stay moist and the meat will be delicious. I’m also going to dice pork to fry pan fried potatoes and saute mixed greens. There’s always a little concern about using fat. Moderation! Use a little, only what you need. Use the same caution with salt pork that you use with butter and all other fats. This fat is all natural real food. Enjoy! This entry was posted in Homesteading, Pigs, Preserving, Uncategorized and tagged putting food up on January 12, 2015 by Homesteader's Supply. If you’re homesteading away from a public water supply you’re probably dependent on an electric water pump or people power. I was shocked the first time we didn’t have water after moving to the country. The idea of electricity and water being tied together had not entered my mind. It wasn’t like that back in the city. We had water no matter what when we lived in the city and small towns. We could flush the toilet no matter what. We might have to suffer through cold water but we could wash up and wash our hair no matter what. It was so easy. Let’s assume public water and a private well are not options or choices. Wells are a topic in itself. Drilled, pounded, hand dug, lined, blasting – it’s more than I know well enough to talk about intelligently. If you know the topic well enough to write about it we’d love to talk with you! Our water pump depends upon electricity to work. Sixteen years ago I said we’d install a hand pump “soon” so that we’re never out of water, but it hasn’t been done yet. Our well cap is in the basement (not cellar) so freezing won’t ever be a problem. If we had a pump outdoors it would have to be frost free. Our high daytime temperature later this week (first week of January) is going to be below 0*F and our frost can easily reach four or even six feet deep. If you’re using a frost free pump, also called a hydrant, you’ll need to know how deep to lay the pipe and how to take care of it during especially cold spells. 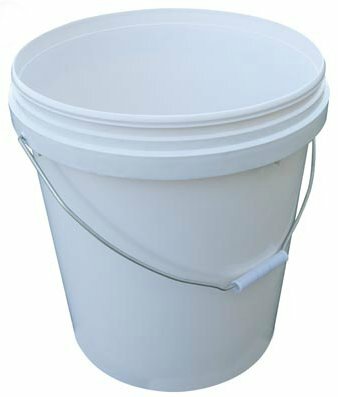 If your water source is close you can carry water in five gallon buckets. Five gallons of water and the bucket weighs just under 45 pounds. You’ll get your exercise and build muscle at the same time. This is best done in a stream or river that will provide water pressure through a hose, or by using a generator. Dipping water can stir up silt, mud and other impurities from the bottom and edge that you don’t want in your water supply. A small gas powered generator can be used to pump water from bodies of water. Be sure to check local and state ordinances. It isn’t always legal to pump water from ponds, streams, rivers or lakes. We pipe water from a stream into our camp. The pressure from the running water determines the water pressure inside. We use the generator to pump water into a 50 gallon black barrel on the roof to have solar heated hot water from spring through fall. The water gets very hot from late spring until the end of September and has to be mixed with cold for showers and dishes. Collecting rain water is a tried and true method used for years. Rain water is a well known and popular method collecting water. It’s illegal in some areas so be sure you can do this before you put your barrels and buckets out. 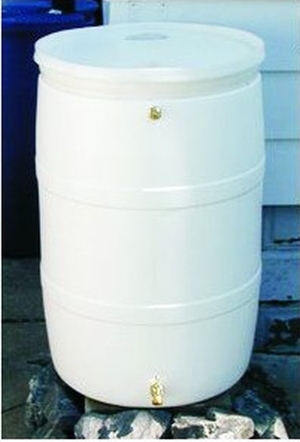 Rain barrels can be connected so that fresh water is collected in the barrel farthest from the spout used to drain water out. CSGNetwork has a handy water usage calculator that will help you determine how much water you use in a day. You might be surprised and how big a water supply you’ll need, and how much more careful with your water supply you’ll want to be. According to the calculator I use about 70 gallons a day. Wow! That includes one five minute shower, four toilet flushes, five hand washes, hand washing dishes once a day, and a load of laundry a week. The United States Geological Survey estimates 80 to 100 gallons of water per person per day is used in the US. Water can be a lot of work. Crystal clear water but it’s very shallow. Natural springs might be an option for your water supply. 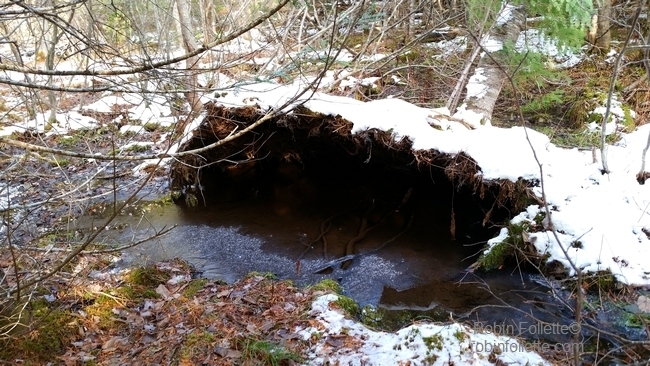 This natural spring over flowed during torrential rain in early November. The tree took enough soil with its roots to make a small area where the water now collects. The water is crystal clear but hasn’t been tested. Be sure your water supply is safe. Deer, bear and smaller wild animals have been drinking here which also means they might be defecating here or very nearby. Active, bubbling natural springs often stay open in winter. I have one about 200 yards from my back door that is open even when we have five feet of snow on the ground. It will supply water in a pinch but it would be a lot of work to get it to the house. You probably have options when it comes to your water supply. It’s not something to take lightly when you’re planning your homestead. This entry was posted in A New Homestead and tagged homesteading on January 5, 2015 by Homesteader's Supply.